Electro-Wash® MX Cleaner Degreaser is a high flash point cleaner that quickly removes soils, adhesives, and residues from insulation jackets and conductors on telecom, fiber optic and coaxial cables, while still being the ideal cleaner for removing oils, greases and dirt from hand tools and metal cleaning operations. Excellent wetting action lifts and removes soils from the tightest areas. 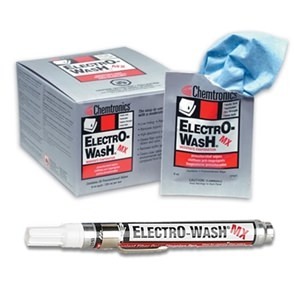 Electro-Wash® MX Cleaner Degreaser is also ideal for removing carbonization, oxidized oils and greases from metal surfaces.